Anyone who has a blog will tell you that traffic tends to arrive at the site in two ways. It’s new posts that generally drive traffic via shares. Twitter, Facebook, bookmarking sites and pingbacks from other blogs. Whatever the format, it’s the recommendation at its heart that triggers the click from users. Advocacy is the currency here, but it’s ‘newness’ that prompts both the share and the response. People take it to mean ‘live’ and want to be there first. Older, archived posts tend to get discovered through Search. It will be someone remembering something they once read, or entering a query and happening to stumble across a relevant post. The bottomless seam of relevant content is always being mined. This isn’t just me saying this. Say Media, who have made it their business to aggregate blogs and leverage them as trusted influencers for brands and advertisers, have attested to pretty much the same thing. Once this was pointed out to me, simple as it seemed, something connected. After all this is a dynamic that’s pretty well-established in, for example, TV. Think about it. Triggers for choosing what to watch these days come in the form of the EPG. There remain some ‘appointments to view’, but largely we wait until we’ve turned the telly on and see what there is, ‘live’. Either that, or scheduling is as likely to be driven by shares in social media as it is by the magazine TV guide. The time when RT could only mean Radio Times is long gone. But when we want to catch-up on something we’ve missed, though, what do we do?. We search for it. We use catch-up services like the iPlayer. We look through the archive for something specific. So, as with blogs, so with TV. If content at opposite ends of the pro-am spectrum are exhibiting shared traits, then I reckon we should take notice. In fact, I’ll go further. I think we should re-think marketing in precisely those terms. On one hand, there’s the live stuff that you’re doing right now. With the decline in cultural latency means that new ideas remain new for far less time. Consumer expectations of having what they want, when and where they want it, have increased immeasurably, so salience becomes ever harder to achieve. On the other hand, there’s the slowly growing pile of (digital) stuff you did before, that’s still out there on show because the web is just one big archive. The first gains traction by feeling as relevant, timely, live as possible. Meet the new expectations of consumers used to having useful, salient stuff when, where and how they want it. That campaign you’ve been developing for a few months (after the other few it took to get approved) just won’t cut it. The second can be re-used in order to renew its value. Re-purpose it. Make it more discoverable. Tell a deeper story about the brand. There’s a great looking app called Tweat.It just out in New York. 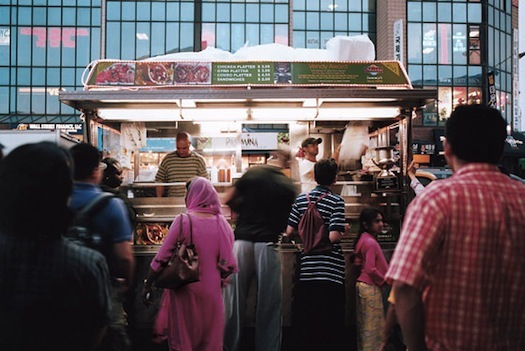 It allows owners of Food Trucks to tweet their location at any given time, and for fans of those Food Trucks to find them. Because when you need a burrito, you need a burrito. It’s centred on location, powered by a mobile device, and made thoroughly social with reviews land recommendations. But mainly it’s about now, because why would be interesting where food trucks were yesterday, or will be tomorrow? It only works because it’s live. Here’s another favourite, from China. 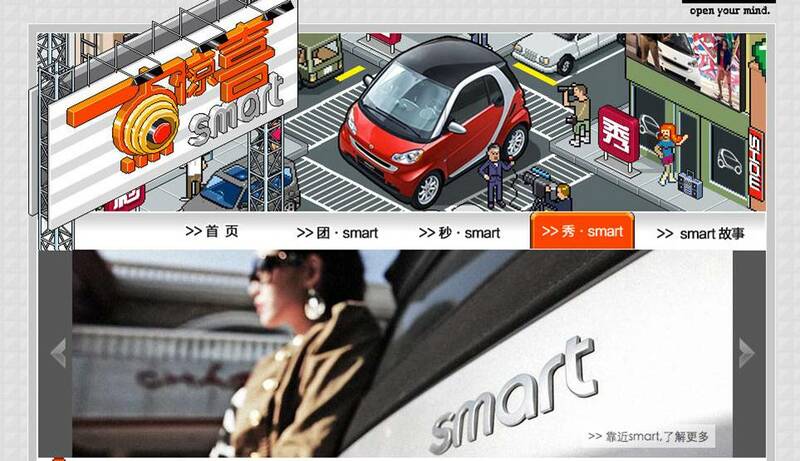 In China, Smartcars fall victim to the slow, protracted purchase model of the car market. Chinese buyers like them initially, but further research into the category sees Smartcar fall down the consideration list. Other cars are simply cooler, more powerful, have more status. The agency (MEC, full disclosure) hit upon the idea of hitching the mechanics of the Groupon e-commerce model to the problem. That is, creating urgency and scarcity around the purchase. They introduced the idea of time-limited offers. They promoted them with three days’ notice. The offers stated that if 200 people registered to buy, everyone would get a 25% discount. The available stock sold out in 3 ½ days. And showroom traffic increased by 24%. All by re-framing largely unwanted stock as a ‘live’ campaign. What I find fascinating is that, far from having killed off mainstream mass viewing experiences as it was supposed to, social media has instead been assimilated into them. Augmented viewing is now (for some) the norm. Some shows prompt viewers to use pre-determined hashtags. American audiences can now tweet their votes for X Factor. But this is doing interesting things to the way we think about engaging audience with TV. Or at least it should be. But what about a more nuanced approach. Check this image. 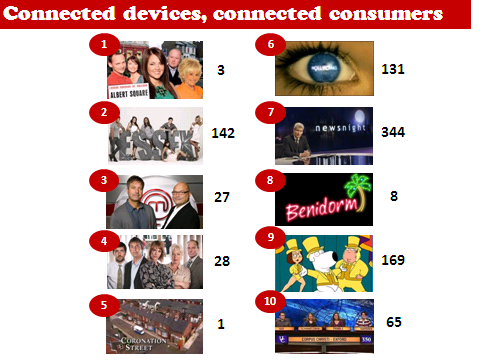 It shows the top 10 programmes based on the volume of tweets they generated, as measured during a standard week in May. Next to them you can see their BARB ranking. Twitter is showing us just how engaged some people are with their favourite programmes. But that those favourite programmes aren’t always the biggest. And it definitely suggests a need to think about audiences as ‘live’ entities again. Or, even better, as ‘live’ collections of individuals again. The first is that the ways to re-purpose existing stuff are proliferating all the time. If you organise an event, make sure it gets filmed. Then turn that into online video, distribute it well and make sure it helps you with your SEO. When users visit your site, capture the data and socialise it. Showing future visitors what their predecessors found most useful or most interesting can be incredibly effective at making the right action more likely. Collect location data of users and turn it into a crowd-sourced map. Provide updates on marketing programmes that fans/users engaged with. Let people know you haven’t forgotten their contribution to a successful product launch. Give them first sight of the next one. Create infographics that re-contextualise elements of the brand history – geographical spread of customers, or levels of interaction with previous campaigns. Fetishise the packaging and advertising history of the product. Or, when you host events (whether online or offline) make sure you capture for posterity people’s participation. Yes, I’m still a bit besotted with Storify. I think it’s because it’s advocacy in its purest form – letting others tell a great story about the brand on your behalf. I made one recently of the time MEC all headed down to the ITV studios to watch David Frost interview Martin Sorrell, Sirs both. So, that’s the first point. The second is about what this means for the future of ideas? As has been said many times before, I think we need to worry less about the big idea, and shift our attention more to the long idea. If activity will remain on public view forever, we should embrace it and turn it to our advantage. Let’s develop ideas that evolve over time. Let’s not take weeks and months to plan a campaign but launch and learn more quickly. And let’s build long ideas out of a series of small, live, ideas. Ideas that, because they’re live, are more relevant, more useful, more likely to be shared, and more personalised. This is a part of a presentation I did earlier this week to a crowd made up of Google, MEC and MEC clients. I’ll be posting the full deck soon. In the meantime, let me know what you think of Live and Archive. Does it work? Is it a new way of thinking that actually has any application. Would love to hear thoughts and ideas. James – some good thoughts in here.